Every brick and mortar business has the same challenge at the beginning: what is their outdoor sign going to look like? Let’s go through a few rules to make your outdoor sign more attractive, and just as important, stake your place in the neighborhood. In fact, this signage issue plagues businesses that have even been around for years. Let’s take a look at your outdoor sign, not only from a graphic design point of view, but as a sales generator. Rule 1 is that Size Matters. You should negotiate the largest sign possible with your landlord and your city. Always ask for a variance that will allow your outdoor sign to be bigger. If your landlord has more than one space open on the building’s outdoor sign, you want the largest one. Rule 2 is that as large as your outdoor sign is, it will cost more to create and cost more to ship, but it is always worth it. See Rule 1. One way to offset this cost will be to use lighter weight materials, which we will talk about below. Rule 3 is to remember that color affects the readability of your outdoor sign. There is a reason that stop signs are red and white. It’s because those are the easiest color on outdoor signs for the human eye to see. Yellow with black writing are the next easiest which is why that color combination is used for directional signs. You will have to take the color of your logo into consideration, but for words like AUTO REPAIR or DENTAL OFFICE or CAR WASH which identify the type of business, not just the specific name of the company, you can get extra visibility. Rule 4 is that your outdoor sign is an invitation and a magnifier. Drivers need to be able to quickly see, understand and react to your sign so readability is the top priority. It must be clearly seen from a distance. Rule of thumb: If your sign is at one end of a football field and the viewer is at the other, she should be able to read it. Rule 5 is to respect your weather conditions. The materials your outdoor sign is created with will have to endure a wide range of temperatures. This constant variance in hot and cold, or extended periods of either, can affect the lifetime of your sign. Make certain that the sign company has included this detail in the quote for your sign. Rule 6 is that Mother Nature has more than temperature to throw at your outdoor sign. Wind, rain and snow can tear your company’s sign from its mounting. Waterproof solid materials are the best. Rule 7 is to prepare for the security of your outdoor sign. We need to consider that graffiti is a possibility. Ask your sign company for a laminate that acts as a protective barrier and makes it easier to get rid of paint. Rule 8 is to remember that a faded outdoor sign is harder to read. Father Time works with Mother Nature to allow sunshine to make your sign become harder to read. This can be offset by using UV inks that are resistant to the UV rays the sun pounds down every day. We should NEVER use water-based inks for our outdoor sign. Rule 9 is that when the sun goes down, is your sign still seen? Consider how your outdoor sign will be lit at night. Will it be lit from behind? Above? How bright can we make it? Brighter is always better!!! Rule 10 is that we want our outdoor sign to be legal. Prior to moving into a building, check with your local government for the rules that apply to signs in your area. Better to chose a different location than to be saddled with the inability to attract clients. When deciding what to put on your sign, think of it as a business card that has to be read and comprehended in 4 seconds. Here is a list, in order, of what you can put on there, depending on the amount of room with which you have to work. We are using a client, 360 Automotive, in Cottonwood Arizona as an example. Your logo. If your logo is hard to read at a distance, then use clean, block letters. 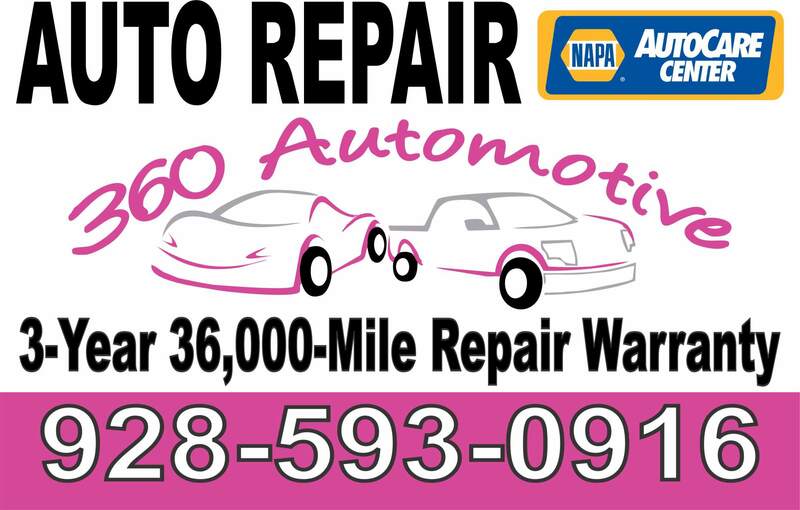 What you do (example: 360 Automotive in Cottonwood, AZ added AUTO REPAIR over their logo). An important bonus: It could be that you are open 24 hours or that you deliver or offer free parking. 360’s is their warranty. If you get co-op money from a supplier to help you pay for the outdoor sign, then their logo can be on there, too, but not to the detriment of your name and logo. Make sure everything is spelled correctly. And don’t put a QR code 35 feet in the air. We found this outdoor sign in Costa Rica that made us sad… and laugh. If you want more information about how to create your outdoor sign, or signage of any kind, connect with us at www.FreeMarketingConsulation.com. We are your extra set of eyes to look at your outdoor sign, and your entire marketing program. At the Free Marketing Consultation page, you take a short assessment, then are invited to view our calendar and choose a time that works best with your schedule for a free 30-minute marketing consulation. Rule – Break a rule to get the outdoor signage you really want, AND, be ready to pay a fine or maybe have to take it down, but, at least you tried to get it the way you really wanted, and if it is nice & creative the officials might let it be for now or longer, maybe for ever.